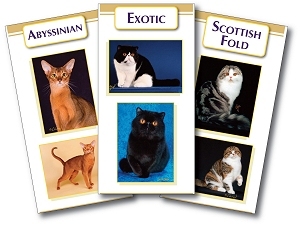 A comprehensive listing of the complete Show Rules of the Cat Fanciers' Association, including a full list of Color Class Numbers, an explanation of the scoring procedure for Grand points, plus the National/Regional Awards Scoring Procedures and Policies. 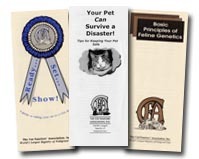 The CFA Show Standards booklet includes a comprehensive standard for each breed recognized by CFA, as well as information on condition and feline structure. The CFA Combined Clerking Manual is a must for anyone interested in the Clerking or Master Clerking Program. The manual outlines the duties for both ring clerks and master clerks, along with rules and mechanical procedures to follow when performing those duties at any CFA cat show. 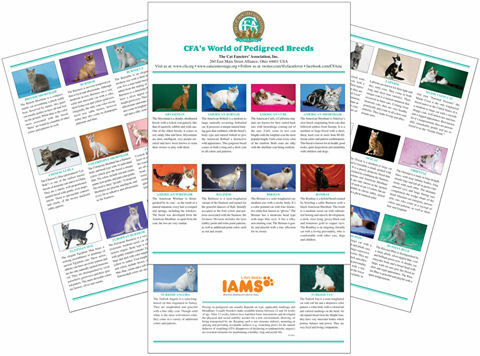 CFA offers an informational brochure for each of our 42 recognized breeds of cats, including several photos and a brief synopsis of the breed. To order additional increments of a brochure, simply hit "INCREASE" on that item in your shopping cart. CFA offers a variety of informational brochures on feline health care. 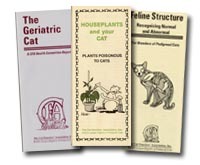 The twenty-two (22) brochures available cover a wide range of topics, such as Feline Structure: Recognizing the Normal and Abnormal, Inflammatory Bowel Disease and Ten Tips for a Poison Safe Household, etc. CFA's General Information pamphlets cover a plethora of subjects. The twenty (20) pamphlets are available on topics such as: Cats & Plants, Changing Laws Affect Pet Ownership, Hints for Determining Cat Color, Should You Breed Your Cat, Welcoming Your New Kitten Home, etc.